Beautifully engraved certificate from Spacehab, Inc. 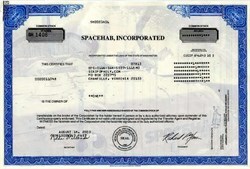 This historic document was printed by the Security-Columbian Banknote Company and has an ornate border around it with a underprint of the the spacehab module inside of the space shuttle in space with an astronaut. This item has the printed signatures of the Company’s President and Secretary. A well managed company with approximately $100 million in annual revenue, SPACEHAB, Incorporated is a leading provider of commercial space services. The Company develops, owns, and operates habitat and laboratory modules and cargo carriers aboard NASA’s Space Shuttles for space station resupply and research purposes. Its Government Services business unit provides Space Station and Space Shuttle support services including orbiter crew compartment integration, stowage, and configuration management to NASA's Johnson Space Center in Houston. SPACEHAB’s Astrotech subsidiary provides commercial satellite processing services at facilities in California and Florida. Additionally, through The Space Store, Space Media provides space merchandise to the public and space enthusiasts worldwide.